Poetry, relevant to particular issue themes, will be created by contributors via invitation, commission and open submission from subscribers. Poetry, Sacred Art and the Book of Kells: A review of James Harpur’s ‘The White Silhouette’. 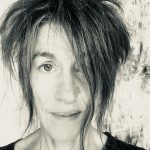 Francesca Diano discovers in the work of a contemporary poet, James Harpur, a maze of connections that takes her on a journey through Neoplatonism to Krishnamurti and quantum mechanics. Sarah Howe is a British poet, academic and editor. Her first book, Loop of Jade (Chatto & Windus, 2015), won the T.S. Eliot Prize and The Sunday Times / PFD Young Writer of the Year Award, and was shortlisted for the Forward Prize for Best First Collection. ‘A New Music’ was commissioned for the ‘Deconstructing Patterns’ exhibition/project. First Light Machine is an original work by J. Wingfield. By lending a voice to the many discoveries unfolding in the fields of quantum theory, relative physics and cosmology, the author invites the reader to explore – through a poetic view – ideas and images as revealed through advances in theoretical science. Helen Moore’s award-winning poem records the mock ecocide trial held at London’s Supreme Court in 2011. The project was initiated by Polly Higgins, an environmental lawyer, barrister and author, as part of the Eradicating Ecocide campaign to make ecocide the fifth international Crime against Peace. Taking his inspiration from Bartok’s ballet suite, The Miraculous Mandarin, artist, poet and writer, John Moat, transforms the story into a contemporary articulation of the alchemical Mercurius – who redeems fallen Adam. James Harpur is an interior poet with a fascination for spirituality. Angels and Harvesters is taken from his published collection of the same name, a collection that displays both human tenderness and an otherworldly wonder. Set Text: Philoctetes is a new poem. This is its first publication.